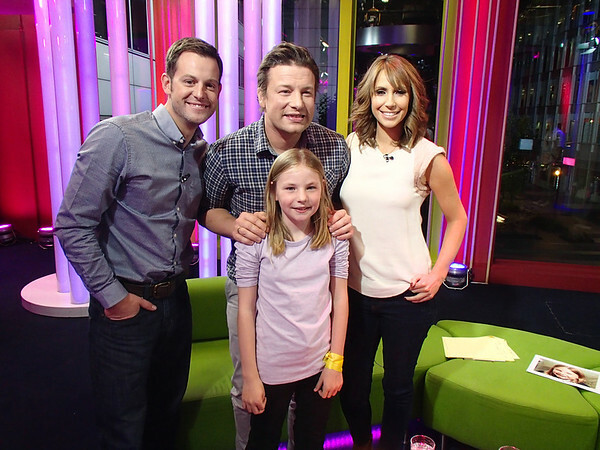 On Monday Dad and I went to the One Show to meet Jamie Oliver. We arrived at the studio at 5pm. Everyone was really nice and we had a look at the control room where there are lots of screens. When I met Matt he was ironing his shirt and we talked about Malawi and our sheep. Alex was getting ready and we chatted. I was fine talking without cameras. The rehearsal was really hard and I got very nervous especially when I saw myself on the film with Louise. They turned the screens around so I couldn't see them. 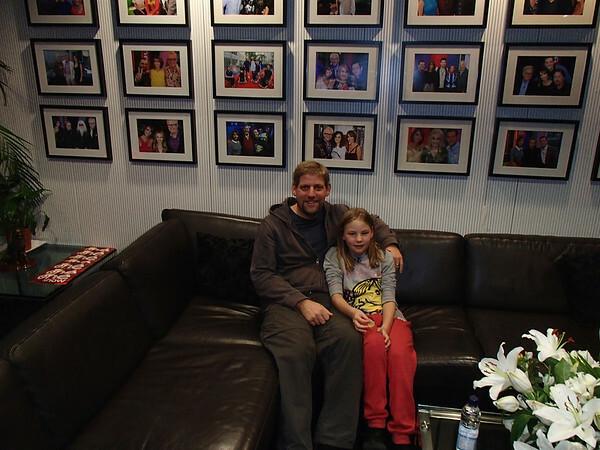 This is the Green room where you wait and there are pictures on the wall of some of the people that have been on the show. We got changed and went to make up. I didn't need any but Dad got some powder on his face and chest. I don't think I was meant to meet Jamie Oliver until we were on television but maybe because I was nervous he came and said hello. He is so nice and easy to talk to. Dad and Jamie talked about school dinners and I talked about Malawi. A lady with an earphone over one ear came and told us we had 1 minute to go and we went and stood in the audience. I was so nervous and I wasn't sure I could do it. When I went on Jamie, Matt and Alex applauded me. They showed the film I did with Louise and a clip from Malawi. Dad and I forgot to mention our book for Mary's Meals and then Jamie had a huge surprise for me! A basket of cooking things that I love. When I was on the train yesterday I was asked if it was the famous basket from the One Show and I nodded. I have only just watched it all on iPlayer because it's difficult to see yourself on TV and I can remember how nervous I was. It seems silly to have been nervous now and I enjoyed chatting to everyone after the show. Dad and I went to Union Jack's after the show and the food was brilliant. 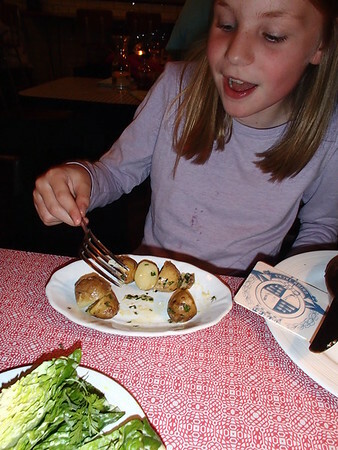 The best bit was the heritage potatoes which tasted like ours at home. I've missed our potatoes. We couldn't watch the documentary live because it was only on in Scotland. I hope it goes onto YouTube or iPlayer Global so everyone can see it. It is very very good. It was great to see Pavlova in it! We tried to Skype for the One Show film but it didn't work. It was a lovely surprise to see her. Also Courtney from the USA who is trying to raise enough for a kitchen also. I am going back to London today but am looking forward to going home and trying some of Jamie's 15 Minute Meals. One lady took an hour and a half to make one. I hope I don't. We tuned in especially to watch you and your Dad. Jamie Oliver was clearly very impressed with what you have achieved. I remember he said something like, "Many people live a lifetime without doing something as important as you have." We'll watch out for the Malawi documentary when it comes to the BBC News Channel over the weekend or well catch it on iPlayer. Well done, Martha - it must have been a bit scary, but we thought you did really well! Martha, you didn't come across as being nervous and you did very well on live TV. No one needs make-up, well maybe your Dad does, Mum watch out your powder puff may go missing. You all did brilliant - so Well Done Veg! Way to go, Martha! My family watched you on the One Show three times (so all of us could see it), and we thought you were fab! I could tell how impressed Jamie Oliver was with what you have done, and how proud your dad is of you. Keep on making the porridge, and learning how to roast potatoes. I am from Cumbernauld, I watched both of your programs Martha, you did not look too nervous on the program, I managed to watch the 1 Show from England on Channel 851 and switched to BBC Scotland on Channel 101 from 7.30 to 8pm, both programs were very interesting and well presented. Once again congratulations for making people aware that eating meals is not always just a matter of going down the road to your local shop. Some of those people in Africa travel miles just to get 1 meal a day. you did very well on the One show and the Malawi documentary is excellent. I do enjoy your writing keep it up and well done. I really hope some kind person makes this available on video, the BBC iPlayer is available for those in the UK only. Martha, you are a rock star. I've been following your blog since the early days; it motivated me to donate to Mary's Meals, and to begin donating regularly to my local food bank here in New York City. Thank you for all you've done to help so many people, and for sharing all this exciting travel and media news. What a treat to see you in Malawi and in the UK press. You totally deserve these positive experiences (and that awesome-sounding gift basket)! Bravo!! I thought you did really well on The One Show and I hope you enjoy your present from Jamie. The documentary was excellent, it must have been great to see how much good the money you're raising can do. It's fantastic to see you've now raised over £120,000. What a star! Well Done Veg and congratulations!! 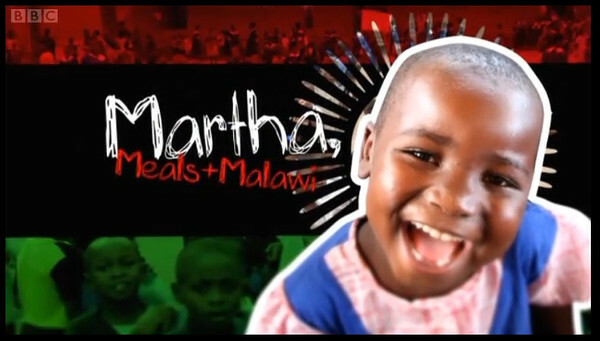 Congratulations Martha for your appearance on the One show - you did really well! And congratulations for your award for the blog! Fantastic. I have really enjoyed reading about Malawi, and seeing some of your photos. Best of all is knowing that you have made a life-changing difference to hundreds of boys and girls by raising so much money for Mary's Meals . You and your family must be so pleased and so proud of you. Congratulations on your award as the Best Food Blog. It is really well-deserved. I also have found it very informative to read contributions from young people around the world and their school food. When Jamie Oliver ignited the debate about school dinners many years ago, I wrote about the system(s) in Spain and the letter got published. While the provision systems are many, the main concept is similar all over. You get a 3-course lunch; there is no choice (except vegetarian, or gluten-free, etc. )- you eat what is cooked, just like at home. Desserts are usually fresh fruit or yoghurt, sometimes cheese and the drink is tap water. Parents get sent the monthly or yearly menu in advance, so you can plan your dinners not to clash with the school lunches. Congratulations on being on the One show, everyone could see you were very brave! And congratulations for winning the blog Award! I have so enjoyed reading all about your trip to Malawi, and seeing some of your pictures. It is wonderful to know that you have made such a difference to the lives of so many boys and girls through Mary's Meals! This is so exciting Martha! Congratulations on everything you've accomplished! I am so impressed by your work and what you have achieved. You are a hero to me. Greetings to you - and to your folks as well, as they obviously are supporting you so beautifully in your work. Good luck to you all from me in Sweden! The documentary is finally up on Youtube! Watched and enjoyed it! Congrads!!! Sure all of you are pooped out - take the phone off the hook and everyone snooze for a good long while. You deserve a nice long rest after all the work and excitement. 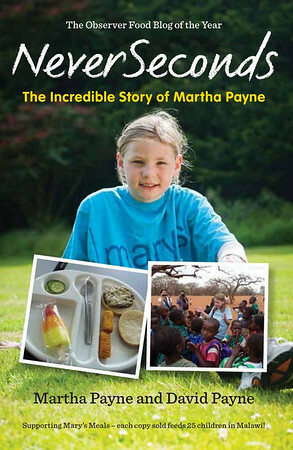 Martha - I saw your documentary for the first time this morning on TV. I come from South Africa, but live in Thailand working as a missionary near the border of Myanmar and Thailand. I have traveled to Malawi before and know the difference that every meal makes to the children there. Watching the documentary this morning reminded me that you really are never too young to make a difference. Never forget to find avenues to provide opportunities for others - I believe that you have a gift in your writing and ability to join together with other organizations that can help many in the future. You are an inspiration to a lot of people and it is wonderful that your blog has been instrumental in providing practical help for so many thousands of children whose life-chances are so much less than your own (or indeed my own many years ago). Congratulations and good luck for the future.